Rich in Organic Compounds: Neem leaf powder has natural antiseptic, antibacterial, antifungal, anti-viral and anti-protozoan properties. Because of its properties, it used to safeguard from various micro-organisms. 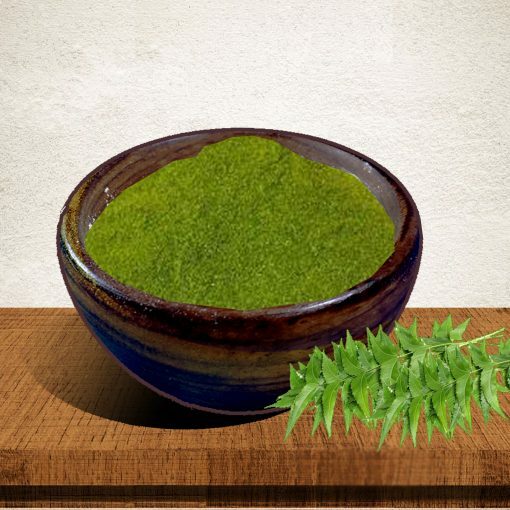 Multi Purposes: Neem powder is widely used as an excellent skin care products. Most effective for skin and teeth. As it is derived from 100% pure and organic neem so it improves dental health conditions. It’s completely safe to use on the skin. You can even add it to your shampoo to get rid of head lice. People also use this mixture in dog shampoos to help kill fleas and ticks. Certified Organic Quality – Blue Lily Neem Leaf Powder is 100% pure, USDA Certified Organic Non-GMO. 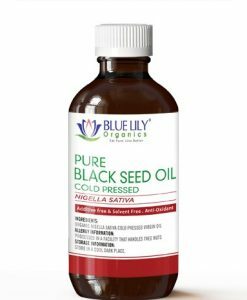 No toxins, No Pesticides, No Preservatives, No Chemicals. What is Neem Leaf Powder? The neem tree (Azadirachta indica) is an extremely adaptable evergreen tree in the mahogany family. Native to the Indian subcontinent, this especially insect- and the drought-resistant tree is also known as “Indian Lilac,” and is commonly grown to provide shade in very dry regions. Neem leaves, in particular, have enjoyed a variety of uses over the millennia. Not only the dried leaves employed to keep bugs away from stored food and clothes, but when they burned the strong aromatic smoke also works as a tried-and-true insect repellent. Blue Lily Organics Neem Leaf Powder is made from the carefully-harvested young leaves of the neem tree, which are dried and ground into a fine powder, and packaged fresh for your use. Neem leaves composed of roughly 7% proteins, and over 3% minerals including calcium, phosphorus, and iron. Aside from a vast array of vitamins like thiamine, riboflavin, niacin, vitamin C, and beta-carotene, neem leaves also contain over 140 additional healing compounds. Some of the most important constituents of neem leaves also include Nimbin, nimbidin, ninbidol, gedunin and quercetin (responsible for its use in anti-malarial remedies), and azadirachtin and salannun (strong repellents). Most, if not all, of these listed compounds, possess germicidal properties. Neem leaves also contain other phytochemicals that contribute to its medicinal value, including limonoids (responsible for its bitter taste), terpenoids, tetranortarpenoids, hydrocarbons, phenolic compounds, flavonol glycosides, and tannins. In India, neem leaf applied topically for its beneficial effects on skin and hair. It used specifically to dress wounds and address other skin concerns. 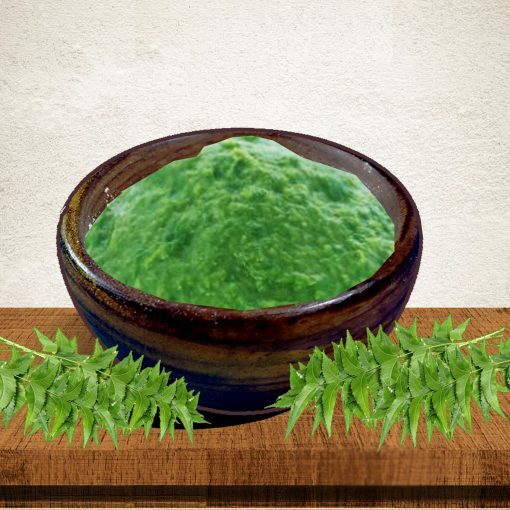 You can use neem leaves as a face pack to reduce the acne caused by bacteria. The mask, also rich in vitamin E, ensures that the skin does not dry out. Even using neem leaves boiled in water can tighten your skin and eliminate blackheads. Neem proves to hydrate the hair, giving it shine and making it dull and flat. You can massage your scalp regularly with neem oil or prepare a good conditioner in your kitchen. The neem leaves boil in water, to make a bundle of hair. Make a paste when the leaves soften. Crush the leaves in a paste and mix with honey. Apply this paste to your hair and wash it after dry to get soft, soft and wrapped hair. The twigs and leaves of the neem tree make natural ‘toothbrushes’. Its oils help keep the teeth and gums clean and healthy. Neem is also a common ingredient in many Ayurvedic blood tonics. Its bitter taste thought to get digestive juices flowing in a way similar to “bitters” used in the Western world. 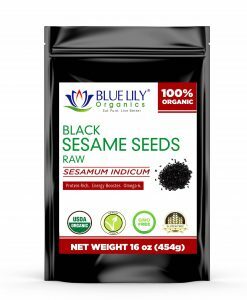 To use organic neem leaf powder internally, just mix ¼ – ½ teaspoon Blue Lily Organics Neem Leaf Powder in hot water to make a pungent neem leaf tea. Or mix a little neem leaf powder in water and gargle daily for fresh-feeling teeth and gums. If you have a medical condition or are taking any medications. Please consult your doctor before consuming organic neem leaf powder. 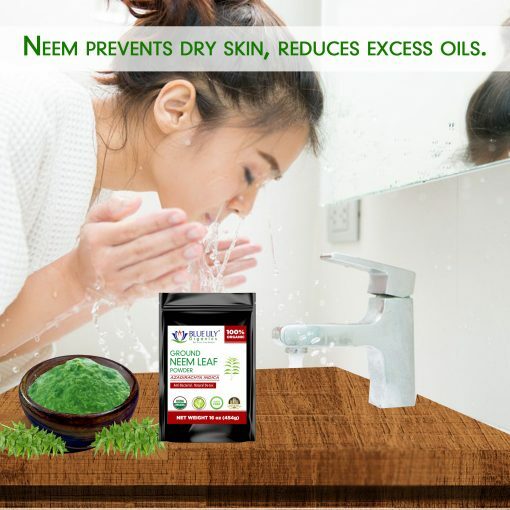 You can reap the benefits of Blue Lily Organics Neem Leaf Powder externally too. Add it to your bath to soothe and rejuvenate. Add a teaspoon of Blue Lily Organics Neem Leaf Powder to honey, yogurt, and also in soy milk and blend into a smooth paste. When applied to the face it nourishes, cleanses and moisturizes the skin. Neem leaf powder is an excellent hair tonic as well. Combine Blue Lily Organics Neem Leaf Powder with honey and apply generously to the hair, then rinse with warm water. Mix a teaspoon of organic neem leaf powder in water to make a paste. It soothes cuts and scrapes when applied. To maintain the freshness and potency of Blue Lily Organics Neem Leaf Powder, store in an air-tight container in a cool, dry place. The shelf life of Blue Lily Organics Neem Leaf Powder is two years; however, keeping it in a tightly-sealed container in the refrigerator may extend the shelf life. Blue Lily Organics Neem Leaf Powder is non-GMO, and naturally-grown with no chemical pesticides. It contains no artificial additives or preservatives and is 100% USDA Certified Organic.